Collaboration by health professionals across the state has reached new heights following the official launch of new pathways for the Statewide Paediatric HealthPathways project on 14 November 2018. 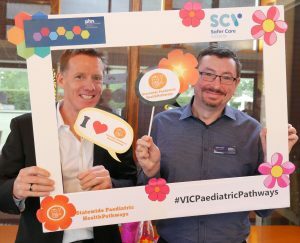 More than 70 people attended the launch, held at the City of Melbourne Bowls Club, to celebrate 29 new paediatric care pathways for Victoria. Colleagues from Primary Health Networks (PHNs) across the state joined GPs, nurses, maternal child health nurses, paediatric specialists and program staff. The event was hosted by North Western Melbourne Primary Health Network (NWMPHN) on behalf Safer Care Victoria (SCV) and the Victorian and Tasmanian Primary Health Network Alliance (VTPHNA). A sense of enthusiasm and excitement filled the room as discussion centred around how these new pathways can enhance paediatric primary care. NWMPHN CEO Adjunct Associate Professor Christopher Carter spoke about the importance of the partnerships necessary to bring this work to fruition. These partnerships include the tremendous collaborative efforts of SCV’s Paediatric Clinical Network, and by the HealthPathways teams and other clinicians who have contributed to the project. Project Lead Laura Collins chaired the event and introduced keynote speakers Dr Annie Moulden, Dr David Armstrong and Dr Mike Starr. They provided context to the broader work done of the Victorian Paediatric Clinical Network and shared updates on other projects that address unwarranted variations in paediatric care across Victoria. Dr Scott Parsons, the lead GP clinical editor for the project, led an interactive case study session to showcase the pathways and how to apply them. Congratulations to everyone involved in the production of these innovative and vital tools for improving children’s health. NWMPHN’s team is now focused on encouraging GPs and other primary health care clinicians to use the pathways. If you wish to know more about how HealthPathways can support your practice team, or to request access or book a demonstration, contact info@healthpathwaysmelbourne.org.au.